The aluminum, glass and steel structure features 17 spires symbolizing fighter jets. The Cadet Chapel was dedicated on September 22, 1963. The principal architect of the chapel was Walter A. Netsch, Jr. of Chicago and the construction was overseen by Robert E. McKee, Inc. of New Mexico. The shell of the chapel and surrounding grounds cost $3.5 million; decorations and fittings of the interior were donated by various individuals and organizations. A special Easter offering was taken at Air Force bases around the world in 1959 to help fund completion of the interior. 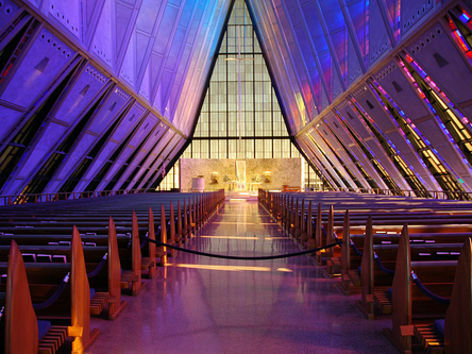 The stated mission of the Air Force Chaplain and the Cadet Chapel is "to inspire men and women to become leaders of character by providing spiritual care and facilitating the free exercise of religion." One of the things that this building does is it brings people together in the presence of God, whatever manifestation that may be. It does it with a common language of elevation and light and structure and shelter and I think that's what is really important about this particular building. One of the metaphors people use is of a squadron of jet fighters pointing up to the sky. You see these aerodynamic forms of seventeen metal folded spires rising up off a very severe flat platform in the midst of the mountains.